SCE Metaballs creates objects that morph into each other creating a fluent animation. ▪ Various buttons and controls have universal functions. They are available for each MADRIX Effect / Layer. ▪ Colors - Opens the Color Table to specify the colors. The default color is White. ▪ BPM - Defines the speed. The default value is 1200. Valid values range from 0 to 9999. ▪ Count - Defines the number of objects. The default value is 5. Valid values range from 1 to 20. ▪ Size - Defines the size of objects [in %]. The default value is 20. Valid values range from 1 to 100. ▪ Outer Glow - Defines the outer shimmer of objects. The default value is 20. Valid values range from 1 to 100. ▪ Inner Glow - Defines the inner gleam of objects which are not filled. The default value is 20. Valid values range from 1 to 100. ▪ Border - Is only available for 2D outlined shapes or 3D unfilled shapes. Defines how thick the outer line [border] of objects is. The default value is 20. Valid values range from 1 to 100. ▪ Influence - Is only available for Motion Type Swarm. Defines a radius in which objects influence other objects [in %]. The higher the value, the more visible the swarm behavior. The default value is 15. Valid values range from 0 to 100. ▪ Separation - Is only available for Motion Type Swarm. Defines how close objects can be to each other [in %]. The higher the value, the more space will be between objects. The default value is 5. Valid values range from 0 to 100. Distribution - Allows you to choose a certain Distribution Mode for the specific parameter. Often, you can then define a minimum value and a maximum value. Uniform - Each object has the same size. Linear - A linear distribution is used to increase the size regularly. Quadratic - The majority of objects will be smaller than the rest. SQRT - Using a square root function the majority of objects will be larger. Cubic - Uses a cubic distribution with mixed sizes. Random - Sizes will be generated randomly. RND - Generates random object sizes each time. This automatically activates Random Distribution Mode. Scale - Is only available for Random Distribution Mode. It allows you to generally increase or decrease the size of objects. Shape - Allows you to choose a specific shape for objects. A certain Size is required before a shape becomes visible. The default Mode is Circle Filled. - Set up at least 2 colors if you want to define a second shape. Both shapes and both colors will then be morphed together. By default, the second shape equals the first shape. - Deselect Auto Adjustment [Color Mixing Link] to set up a different, second shape. 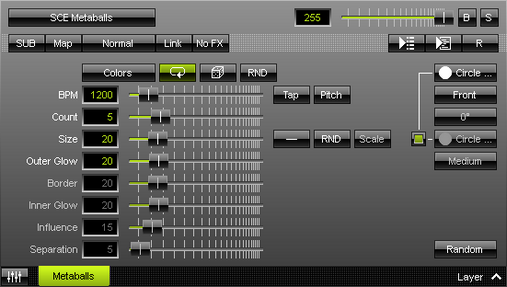 - When using at least 2 colors or using the Color Table Random Mode [RND], you can set up the Color Mixing Sharpness . It allows you to choose how intensely the colors are mixed [Very Blurry, Blurry, Slightly Blurry, Medium, Slightly Clear, Clear, or Very Clear]. The default Color Mixing Sharpness is Medium. Shape Alignment - Allows you to choose to which side objects are aligned to. This is mainly relevant for 3D. The default Shape Alignment is Front. Shape Rotation Type - Is only available for specific Shapes. Defines the angle in which objects are rotated [0°, 90°, 180°, 270°, Random]. Motion Type - Choose how objects move and behave. The default value is Random. Random - Objects move randomly and independently of each other. Swarm - Objects react according to a swarm intelligence and thus imitate their movement behavior. Restore Default Layer Settings - Restores the default settings of the Layer. - All Layer Settings and Effect Settings will be restored to their default values. - This does not include the MADRIX Effect selection, the Effect Parameter Chaser [which will be paused], or the Layer Macro [which will be stopped].